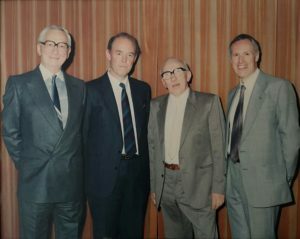 It was the summer of 1969 when four engineers: Messrs Moult, Sullivan, Doncaster and Coombes (from left to right in the photograph below) founded The Analytical Development Company Ltd. to manufacture infrared gas analysers in Leytonstone, London, UK. Within a year, they had expanded into a factory unit in Hoddesdon (close to where conspirators apparently once plotted to assassinate King Charles II in 1683). 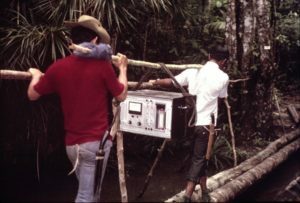 Founding directors of The Analytical Development Company Ltd.
225 MKII carbon dioxide analyser in the field. By the early 1980s, crop scientists were needing to move their research from the laboratory into the field. So, in 1983, the very first portable Leaf Chamber Analyser (LCA-1) was developed. The full production unit (LCA-2) followed in 1984. The success of the ADC225 and LCA-2 in the 1980’s led to British government export awards. By this time the company had become known to most scientists as “ADC”. In 1987, ADC joined the umbrella of the Halma group. The LCA-3 was launched in 1987 followed by the LCA-4 in 1993, each further improving the portability and performance of photosynthesis instruments. 1994 saw the introduction of our first portable leaf area meter (now the hugely successful AM350). 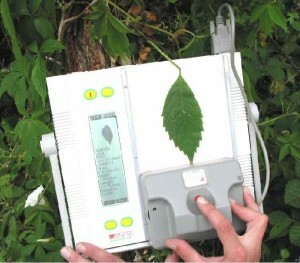 The AM350 leaf area meter in use. From ‘ADC’ to ADC BioScientific Ltd.
ADC Bioscientific Ltd. was established as an independent company in 1998, through a management buy-out of the ADC plant science division, headed by Sally Donaldson and Dave Mann. New developments in portable photosynthesis systems followed. The arrival of our LCi in 1999, the first analyser to incorporate a miniaturised IRGA within the handle, and LCpro in 2001, followed by LCpro+ in 2004, strengthened our reputation as leaders in portability and ease of use. In 2006, we expanded into other parallel areas of carbon cycle research. We addressed the growing global interest in soil respiration with the development of the portable SRS series, followed by the automated ACE system in 2008. Our range of portable photosynthesis systems was further enhanced in 2011 by the LCi-SD, LCpro-SD and SRS-SD series. ADC BioScientific Ltd. are proud to celebrate 50 years of ADC, a testament to the popularity of our products in the ever-changing research and economic climates. We also celebrate the release of a new generation of instruments; our EGA60 series, LC pro T, LCi T and SRS T systems, together with several advances in chlorophyll content and fluorescence measurement from our partner company, OptiSciences Inc., Hudson, USA (CCM300, Plant Stress Kit, iFL integrated system and Monitoring Fluorometer).